The all-new Club OS email builder is almost here! September 27th, this powerful new feature will be released system wide, and you can start creating more dynamic and engaging email content. The enhanced email builder is so full of amazing tools that we had to dedicate two blog posts just to talk about them. Below is part one of our rundown of the cool things you can do! Design emails in a snap with drag and drop functionality. 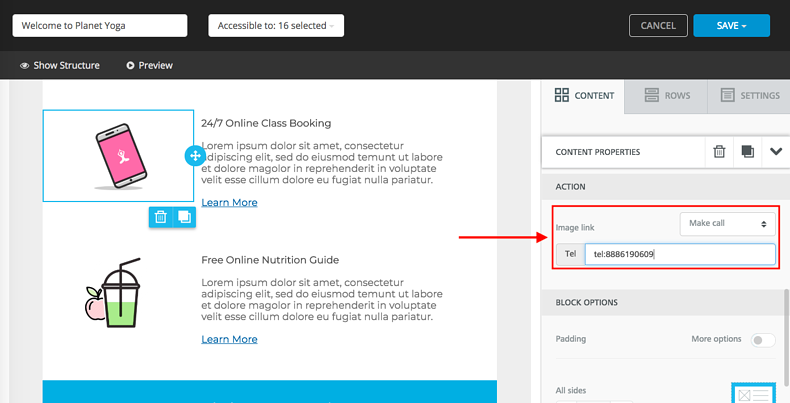 The ‘Rows’ menu enables you to select pre-made content rows to structure your email. 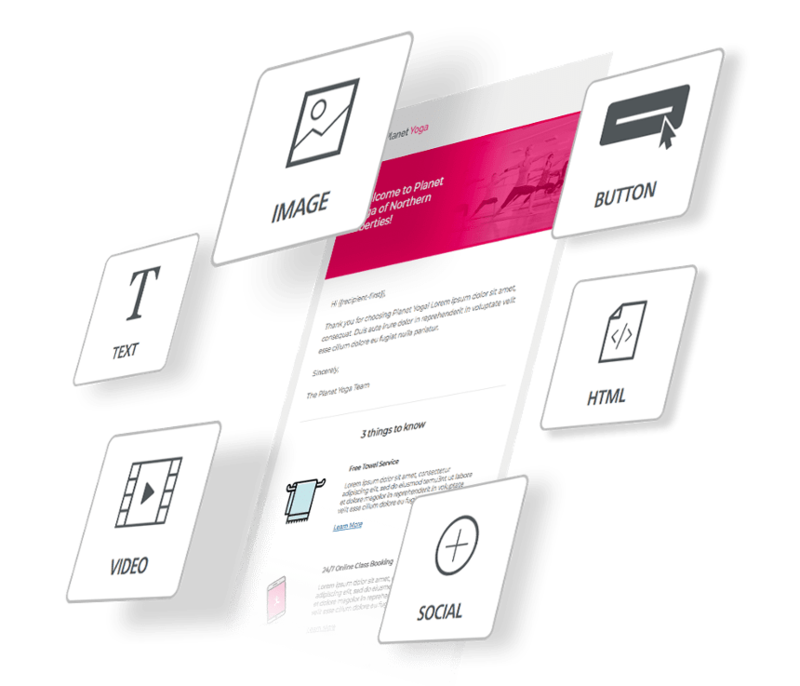 The ‘Content’ menu features seven content tiles ranging from Text and Images to HTML and Video. 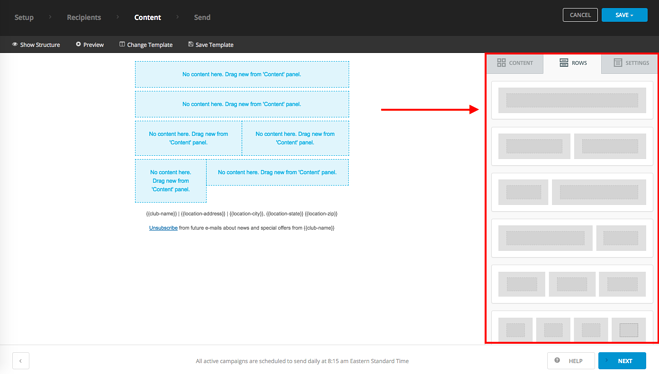 Drag and drop content tiles in the perfect place in your email body then add your text, image, or video. 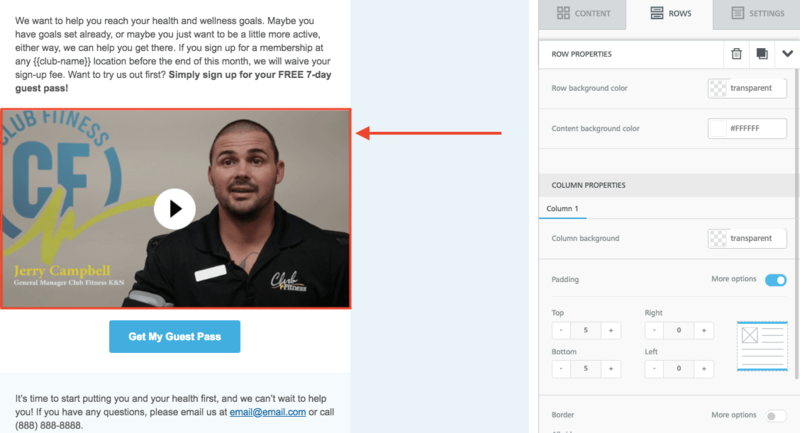 Include your gym or studio’s fitness vlog, virtual club tour, or any other video content within your email marketing. 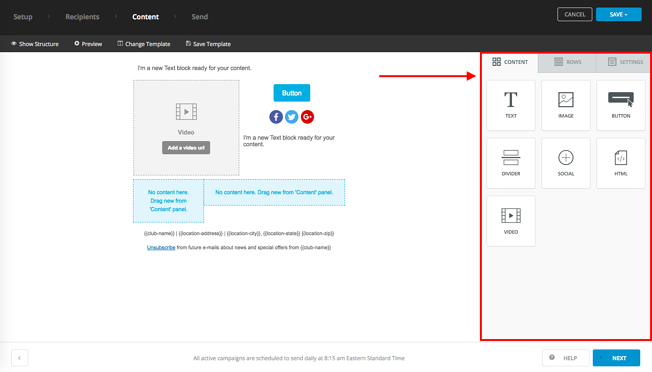 The ‘Video Tile’ enables you to link YouTube and Vimeo video URLs, and a video preview will populate within the email content. Once clicked, recipients will be rerouted to the corresponding video platform and the video will begin playing. Looking to boost prospect contacts from email marketing? Insert clickable buttons and images with your club’s phone number linked. When the recipient clicks the button or image, they will be automatically redirected to call your club. This feature works for all recipients who view your email through a mobile device. Recipients can also take advantage of this feature through a desktop if they’ve established a Google Voice number. Don’t overwhelm recipients with an information overload. Stick to the most important details in the email body then attach supporting documents like class schedules, workout plans, and signup forms to clickable buttons or images! The email builder supports word documents, PDFs, and Excel files. Congratulations! Your email looks great... in the email builder, but what about your recipient’s inbox? Does the bold color choice still work? Are the images too big? Too small? Don’t sweat it. We have you covered! Preview your email in both a desktop and a mobile view. That way, you can rest easy knowing your email looks incredible no matter which device a recipient uses to open it. 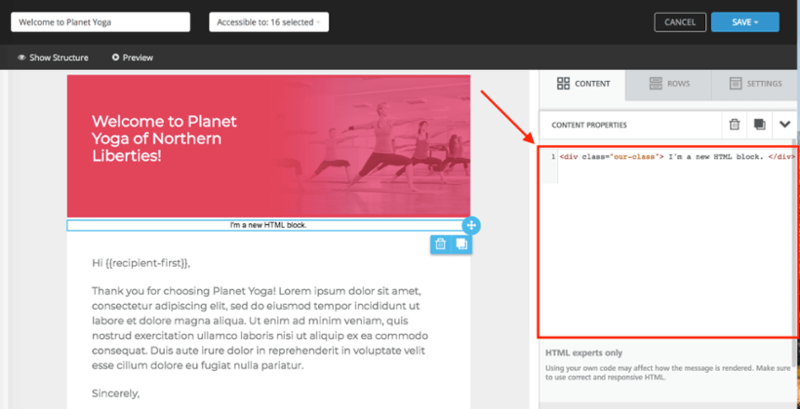 Take total control of your email’s look and feel by adding custom HTML into the email builder. This feature is recommended only for those with experience using HTML. Improperly formatted HTML can affect how the email is rendered and viewed on a recipient’s device. Social media is the public face of any gym or studio. 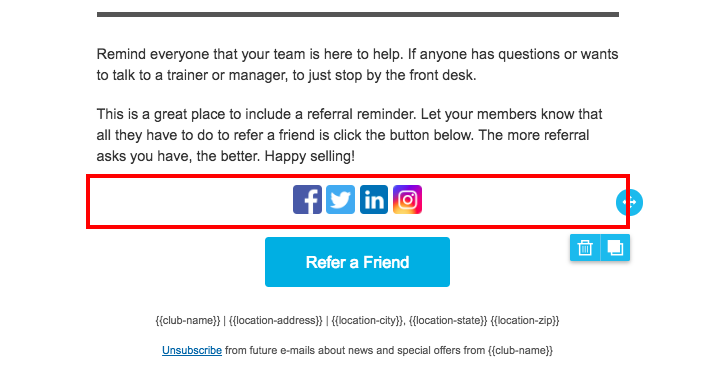 When used correctly, social sites attract new prospects, update members on club happenings, and act as a platform to promote the club’s mission. Select from 19 website icons to insert into your email. Link each site’s URL to the corresponding icon to drive traffic and boost followers. 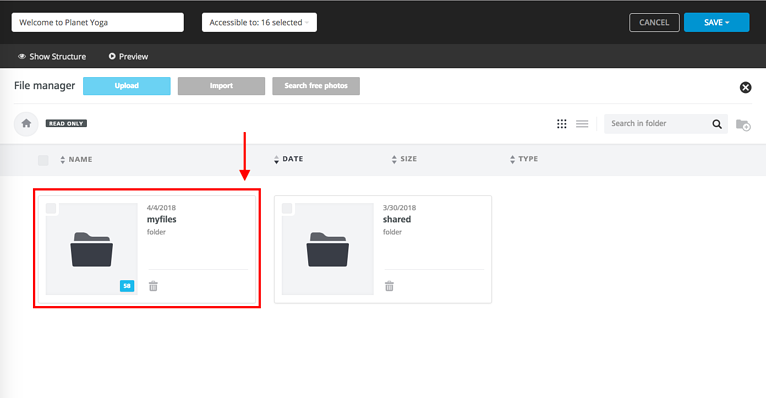 No more losing files on your computer or sending images back and forth between your team. Host images within Club OS for easy accessibility. Upload images into your club’s shared files, and use them for any future email marketing campaigns. Customize images to deliver a personal touch to each recipient. Dynamic images enable you to add dynamic tags to image URLs. Once sent, the dynamic tag is replaced by specific data pulled from each recipient's profile. 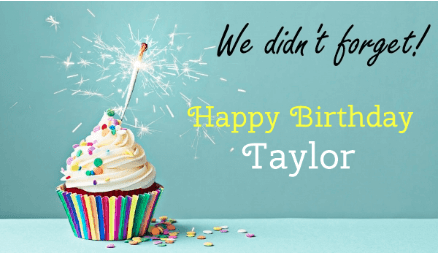 That means, you can insert a happy birthday image into your email that will populate with each individual recipient’s first name. Learn more here. Ready to build better emails or just want a closer look? Schedule a demo to preview the email builder!